It is usually late June or even into July before our Roscoeas appear, never mind flower, so this is quite an early flowering for us. I cannot say that they are easy to grow in our garden- I think our ground is too well drained for these plants. I can show you exactly what the soil under our garden is like because our neighbour is building an extension and I took some pictures of the soil profile. The picture is looking towards our garden and the bulb house is just behind that hedge. 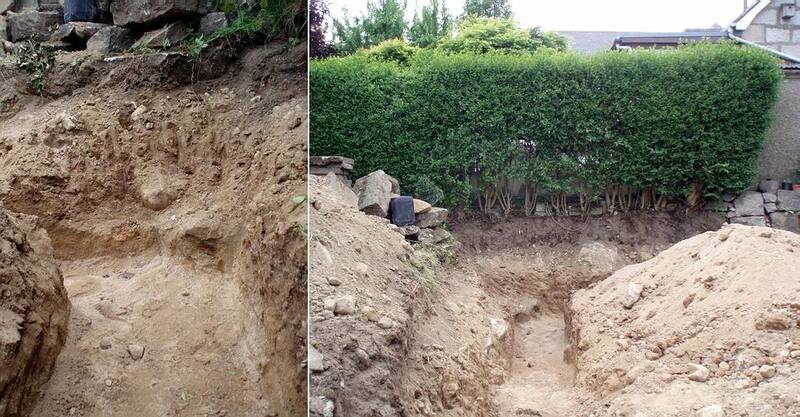 You can see the thin layer of sandy loam sits on top of a very free draining stony sandy sub soil, to this you can add 30 years worth of garden compost which we add as a mulch and that is as close a look at our soil profile that you can get. In an attempt to get better results I split all our plants last year and planted them in various different locations in the garden in an attempt to find the best situation for them. I think their preference is for what I call vegetable plot growing conditions where they can be in well-dug soil, a good supply of water during the growing season and a relatively dry winter rest. When we first started out in this garden we could provide these conditions and we grew meconopsis, gentians, primulas and roscoeas very well, lifting and splitting them and replanting them into newly dug soil with generous amounts of good garden compost on a regular basis. 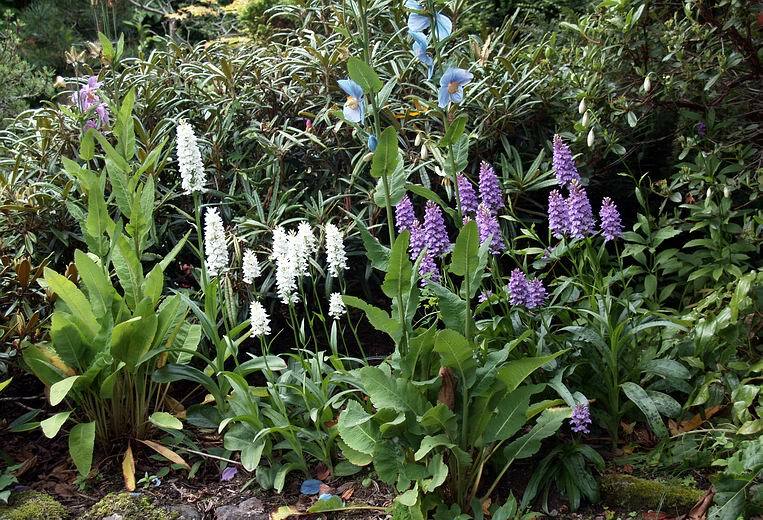 As the garden has become more established and with the number of plants we have making it almost impossible to dig a bed over, these are the plants that have suffered most. 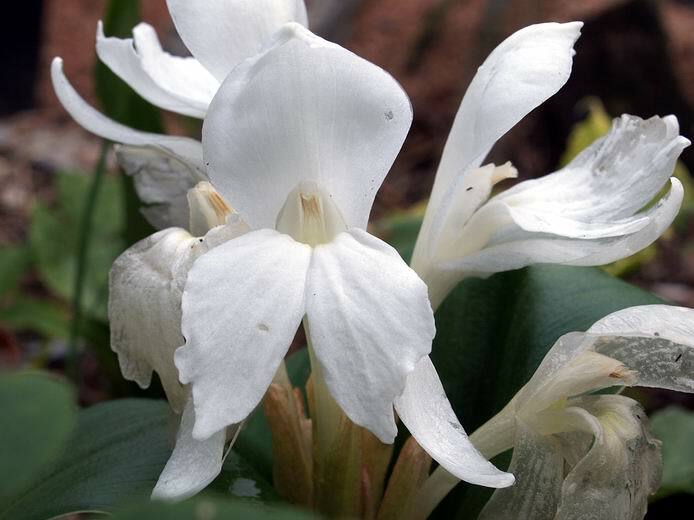 Roscoea humeana alba is my favourite of all: the stunning white of the flowers has to be seen to be believed. Notice how the petals go translucent when they are soaked in water - the short lived flowers do not hold up well in rain at all which is odd for a plant that seems to require plenty water during growth - perhaps they are used to ground water. 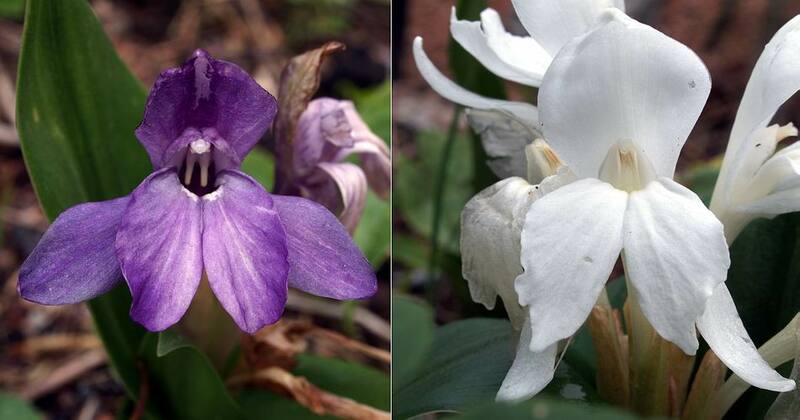 There is a long article on Roscoea by Gary Dunlop in 'The Alpine Gardener' (the latest AGS bulletin) which I look forward to reading. I am getting a very good crop of seeds on the Calochortus uniflorus that I showed some weeks back. This is especially rewarding in what is one of the worst years we have had for seeds on the bulbs in both the garden and under glass. It is interesting to note that they are not the flat lily like seed found on most of the Calochortus I have grown but are more like a small Erythronium seed to look at. 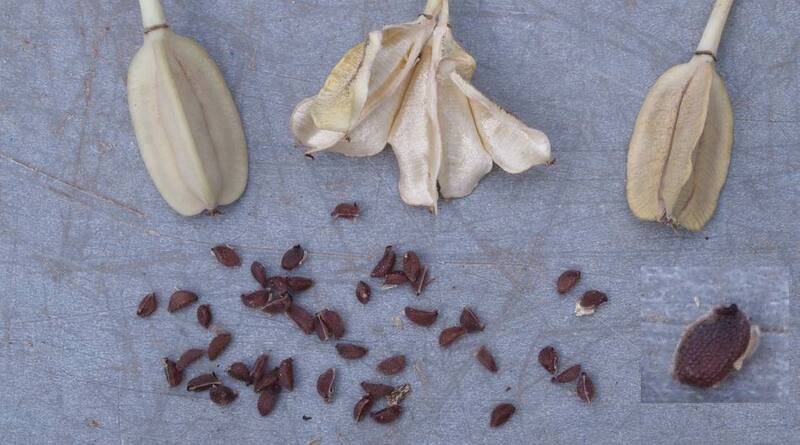 Talking of Erythronium seeds, I was lucky to receive some E. caucasicum and sibericum seeds this week. I am always delighted to receive seeds and I thank all the generous friends that send them to us - I do not like to name you here in case you are inundated with requests but you all know who you are and I thank you most sincerely. The chance to add new genes to our collection is always a pleasure especially when they are Erythroniums. 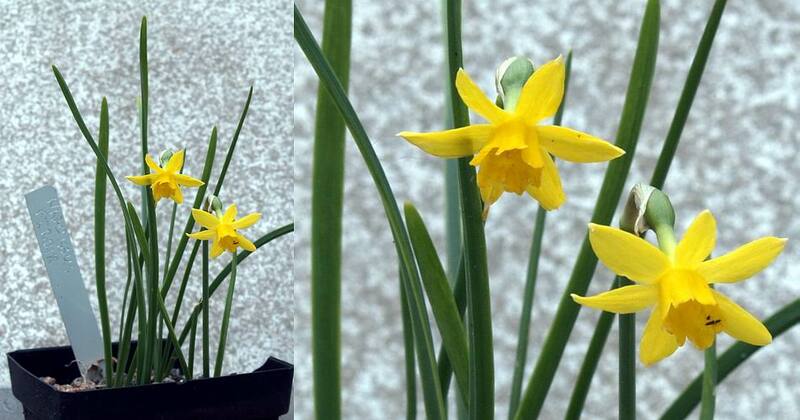 Talking of presents, another dear friend sent me a small package of Narcissus bulbs from Australia and some are flowering now as they try and adjust to being in the Northern Hemisphere. I have always stated that bulbs have an inbuilt time clock so they know when they should come into growth - I call this the time window - but I have always said that this hypothesis breaks down when bulbs are grown in the Southern hemisphere. The trigger that brings the bulbs into growth must be able to detect the seasons and this is most probably done by temperature whether it is absolutes, gradients or a combination of both I am not sure. All the bulbs are growing now well out of season and I hope that they will adjust to our seasons and flower along with the other narcissus early in 2009. 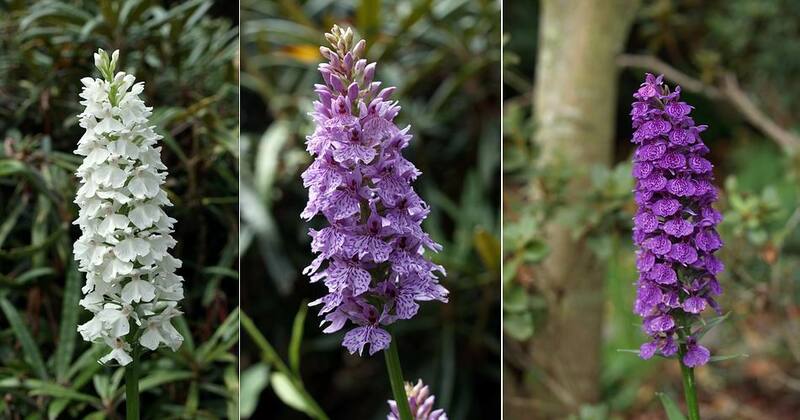 One group of plants that are doing very well in our garden are the Dactylorhiza - having suffered some losses to fungal attack some years ago all our plants are now very healthy. 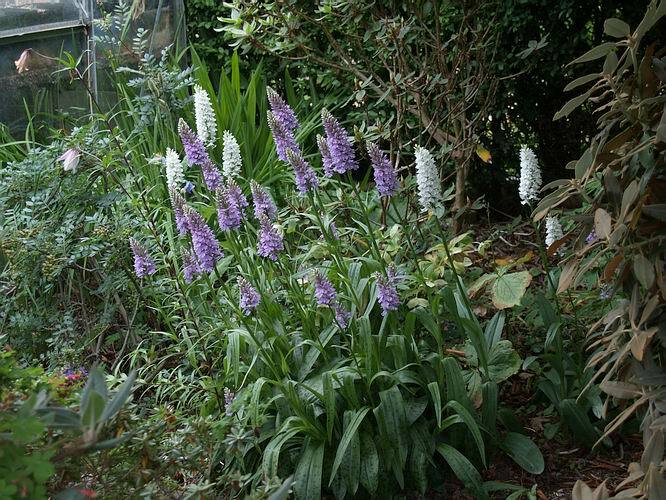 Nearly all our Dactylorhiza are now self seeded and have all the vigour and health of young plants flowering well and clumping up nicely. One of the old cultivars which we managed to nurse through the fungal attacks is the beautiful white 'Eskimo Nell' . 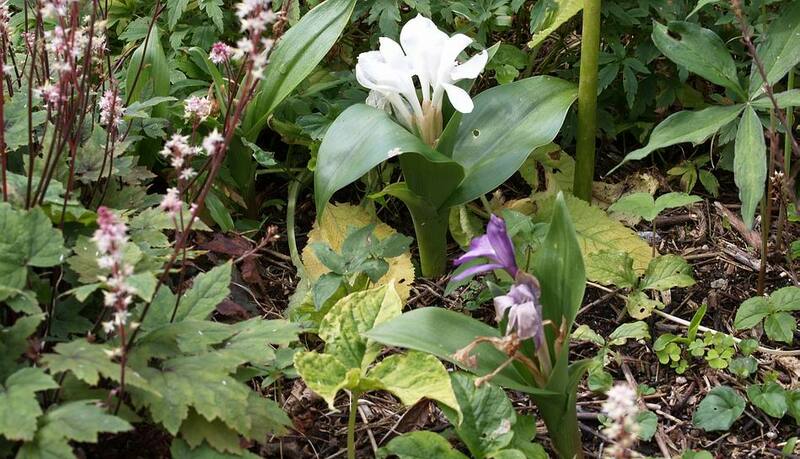 Here are a few flower heads with 'Eskimo Nell' on the left along with two random seedlings. One of our methods of keeping 'Eskimo Nell' going was lifting and splitting it on a regular basis at least every second year. That meant that it never formed a dense clump and that we could plant individuals in as many sites around the garden as we could and this strategy has worked. The large clump in the centre has bulked up in four or five years from a single seedling and I meant to split it last year so that is now on my priority list of jobs to do latter this year. 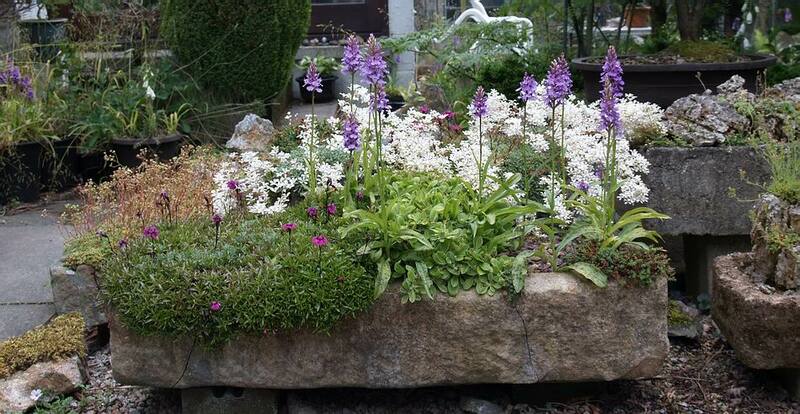 So where do the seedling Dactylorhiza come from? The most common places I find them are in undisturbed pots and troughs. I do take the seed heads off the plants when they are ripe and shedding seeds and I shake the seeds around the troughs with very good results. 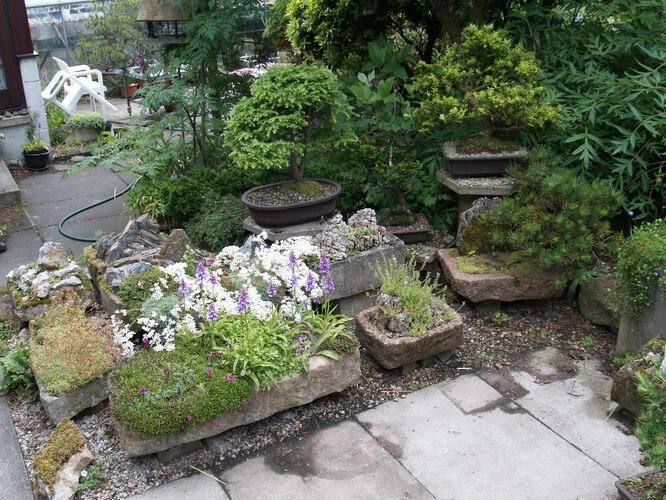 Here is a group of troughs some are recently redone so have no orchids in yet but all the established ones have seedlings in. 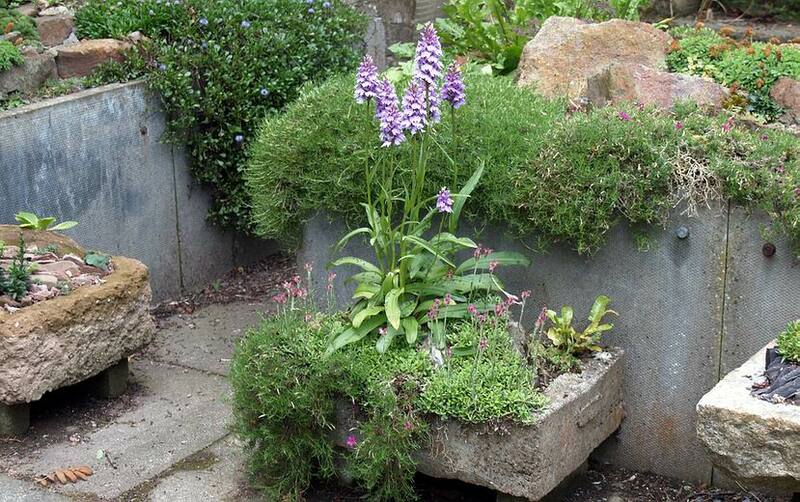 Last Autumn we took 150 Dactylorhiza seedlings out of this trough alone and planted them in the garden. We left a few in to retain the effect and provide more seeds which will continue the process. 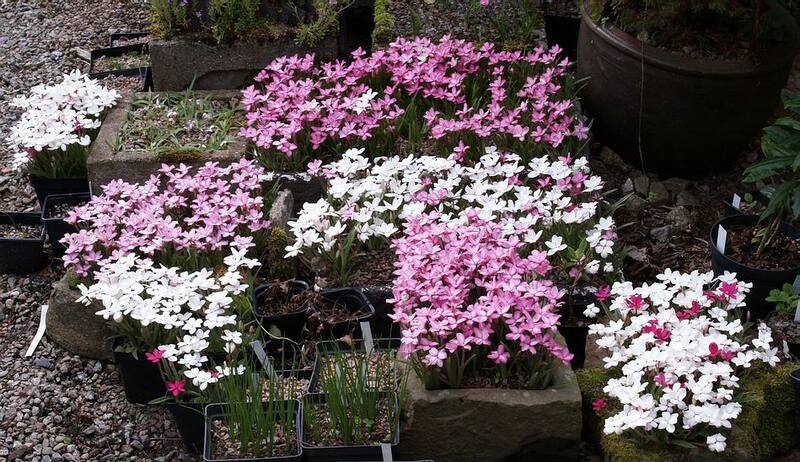 On the subject of troughs the Rhodohypoxis troughs that live in the bulb house all winter are just coming to their peak - provided they get plenty of water they will provide a colourful display into August or even September. 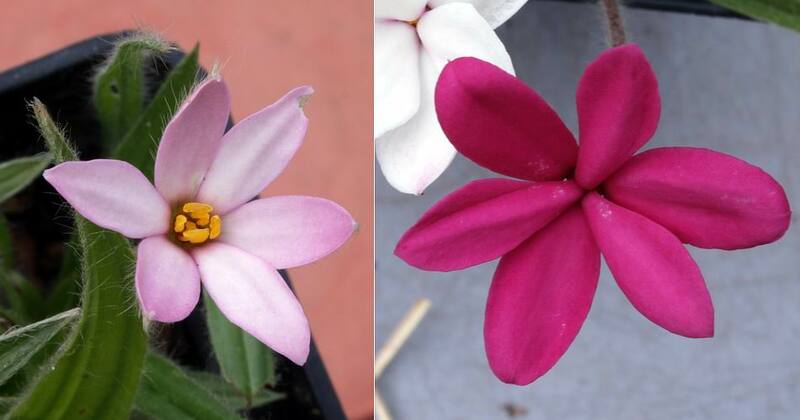 An interesting comparison between the Hypoxis x Rhodohypoxis which displays its anthers and style and the rather shy Rhodohypoxis that hides its reproductive parts from public view with its overlapping petals. Note:- Next weeks bulb log will be late and will not be online before Monday 14th July.